Oracle announced yesterday that PeopleTools 8.57.04 Product Patch is now available for on-premises downloads. Go to the PeopleTools 8.57 Home Page on My Oracle Support (doc 2433119.2) for more information and a link to the PeopleSoft Patches Home Page. This patch is also available on Oracle Cloud Infrastructure (OCI). All customers using PeopleSoft Cloud Manager will be able to subscribe to the PeopleTools 8.57 channel and have the new patch automatically downloaded to their cloud repository and ready for one-click upgrade/patching. I'd like to extend thanks to all the customers and partners that took the time to upgrade a PeopleSoft instance to 8.57 using PeopleSoft Cloud Manager. Many have shared their stories in webinars, conference sessions and blog posts. One of my favorites is a blog post from Graham Smith, Cedar Consulting, who in this post 'PeopleTools 8.57 Upgrade Magic' coined the term 'Magic Upgrade PeopleTools Button'. The name is going to stick. Visit my previous post PeopleTools 8.57 is Available on the Oracle Cloud for more information and links to additional resources on the new Tools release. Also, don't forget to stay informed with the Tech Updates (doc 764222.1). There are important updates about how 8.57 is the last PeopleTools release that will support MAP technology and the DB2 LUW platform. For those of you that would still like to try the 'Magic Upgrade Button' in the cloud, you can still do that with a free trial account. Instructions have been made into a spotlight video, Upgrading to 8.57 on Oracle Cloud using PeopleSoft Cloud Manager. You can find a link to that video and all spotlight videos here. There is a great opportunity to learn more about running your PeopleSoft Applications on Oracle Cloud Infrastructure (OCI). OCI is Oracle's leading Infrastructure as a Service (IaaS) Cloud Platform, and many PeopleSoft customers are choosing it as the IaaS platform for PeopleSoft. In this virtual workshop you'll hear all the technical details about OCI and see firsthand how you as a PeopleSoft customer can benefit. Specialist will be on the call to answer any of your questions after the webinar. Don't miss this exiting event! With the latest updates to Oracle Cloud Infrastructure, you now have a cool new way of launching instances. This new feature makes it easier than ever before to launch a PeopleSoft Cloud Manager instance. We received your feedback on how downloading and uploading Cloud Manager was taking too much time. I’m very happy to say that we’ve heard you, and now we have delivered a surprisingly simple solution. Before creating the Cloud Manager instance, you should have set up your networking (VCN and subnet) and configured all required security rules. To launch a new Cloud Manager instance, navigate to your tenancy and go to the dashboard, as shown here, or the Instances page. From the dashboard, click the option Create a VM instance. You will now see the new pages to create an instance as shown below. Enter the name for your instance and select the availability domain (AD) in which you want to create your Cloud Manager instance. Next step is to select the Cloud Manager image. By default, Oracle Linux 7.5 image is chosen. Click Change Image Source to search for the Cloud Manager image. On the Browse All Images page, select the Oracle Images tab. Here you’ll find the latest Cloud Manager image for OCI. Select the image and accept the terms and restrictions after reading them. Click Select Image to use the chosen image. Choose the Virtual Machine instance type and select a VM shape of your choice. Select a compartment in which the Cloud Manager instance will be created. Select a VCN and a subnet for the Cloud Manager instance configuration. Click Create to deploy the instance. There you go! Creating a Cloud Manager instance is now so easy. Note that you still need to download the Oracle Linux Image for Cloud Manager from My Oracle Support, upload it to object storage and import as a custom image. After setting up Cloud Manager instance, continue from Downloading the Oracle Linux Image and Uploading to Object Storage step in the install guide here. After you have the Oracle Linux image, and the Cloud Manager instance is provisioned and running, SSH into the instance and follow the instructions in the install guide to run the Cloud Manager Instance Configuration Wizard. Now that 8.57 is generally available to run in the cloud, I’ll outline the steps to get it up and running so you can take it for a spin. It was announced in an earlier blog that PeopleTools 8.57 will be initially released to run on the Oracle Cloud before it’s available for on-premises installs. That means you’ll want to use PeopleSoft Cloud Manager 7 to get it up and running. There’s probably a pretty good chance that this is the first exposure you’ve had to Cloud Manager so it’s worth explaining what you’ll do. The process is pretty simple. First, you’ll get an Oracle Cloud Infrastructure (OCI) account. Then you’ll install Cloud Manager 7 onto that account. Once installed, Cloud Manager 7 is used to download the 8.57 DPKs into your Cloud Repository. Then you’ll use Cloud Manager 7 to upgrade a PUM image from 8.56 to 8.57 using the downloaded DPKs. If you’ve been through a PeopleTools upgrade before, you’ll be amazed how Cloud Manager automates this process. The steps outlined below assume that you are new to OCI and Cloud Manager. If you are already familiar with Cloud Manager and have it running in your tenancy, then update your Cloud Manager instance using Interaction Hub Image 07 as described here and go to Step 4. Step 1: Get your Oracle Cloud trial account. If you are new to OCI and PeopleSoft Cloud Manager, then please go through all links below to help you get started quickly. Using the link given above, request for a free account that will give you access to all Oracle Cloud services up to 3500 hours or USD 300 free credits (available in select countries and limited validity). When your request is processed, you will be provisioned a tenancy in Oracle Cloud Infrastructure. Oracle will send you a Welcome email with instructions for signing in to the console for the first time. There is no charge unless you choose to Upgrade to Paid from My Services in the console. Step 2: Set up your OCI tenancy by creating users, policies and networks. Refer to OCI documentation here for details or get a quick overview in this blog. After this step, you will have your tenancy ready to deploy PeopleSoft Cloud Manager. If you are on OCI Classic then you can skip this step. Step 3: Install and configure PeopleSoft Cloud Manager. Follow the OCI install guide here. If you are on OCI Classic, follow the install guide here. Step 4: Subscribe to download channels. The PeopleTools 8.57 download channel is now available under the unsubscribed channel list. Navigate to Dashboard | Repository | Download Subscriptions. Click on Unsubscribed tab. Subscribe to the new Tools_857_Linux channel using the related Actions menu. Also subscribe to any application download channels, for example, HCM_92_Linux. Downloading new PeopleTools version takes a while. Wait for the status to indicate success. Step 5: Provision a demo environment using PUM Fulltier topology. Create a new environment template to deploy an application that you downloaded in Step 4. Use the provided PUM Fulltier topology in the template. Using this newly created template, provision a new environment. If you already have a PUM environment deployed through Cloud Manager, then you can skip this step. Step 6: After the environment is provisioned, navigate to Environment Details | Upgrade PeopleTools. On the right pane, you’ll have an option to select the PeopleTools 8.57 version that you have downloaded. Select the PeopleTools version that you want to evaluate. Click Upgrade to begin the upgrade process. You’ll be able to see the job details and the steps running on the same page. Click on the ‘In progress’ status link to view the upgrade job status. After the upgrade is complete, click the status link for detailed upgrade job status. In the previous blog on setting up tenancy, you learned that a Virtual Cloud Network (VCN) and subnets must be created as a prerequisite for PeopleSoft Cloud Manager Image 6. In Oracle Cloud Infrastructure (OCI), you get the flexibility to configure networking to mimic your on premises environment. Networking can be configured in many ways for PeopleSoft environments. You can have separate subnets for demo, development, testing, pre-production and production environments. You can also group environments into two subnets, one for production and another for non-production environments. Alternatively, you can create one subnet each for database, middle tier components (Application Server, Process Scheduler, and PIA), PeopleSoft Client, Elasticsearch instances and load balancer. Another option is to create only three subnets, one for load balancer, the second for database and the third for rest of the instance types. Subnets can either be public or private. You can choose to deploy all instances on a private subnet to secure them from the Internet, or put them on a public network where they are accessible from the Internet, or put a few on private and a few on public subnets. Complete flexibility! In this blog, let’s take an example of a simple networking architecture. This example network has one VCN with one public subnet and one private subnet. The public subnet (red dotted line in the illustration below) hosts the Cloud Manager, File Server, middle tier, PeopleSoft (Windows) Clients and Elasticsearch instances. Database instances are hosted in a private subnet. First step, create a VCN using OCI web console by selecting Networking, Virtual Cloud Networks. Let’s call it MyVCN. Note. To locate the commands mentioned here, click the Navigation Menu at the top left of the OCI console home page. You can choose to create the default subnets by selecting the option Create Virtual Cloud Network plus related resources or select Create Virtual Cloud Network only to create your own customized subnets. Let’s select the latter option for the purpose of this blog. In the example below, a VCN is created with a CIDR 10.0.0.0/16. You can use a CIDR that mimics your on premises networking too. Read more on VCN and subnet here to familiarize with the concepts and management of networks. The next important part is creating security lists. By default every subnet will have a security list. You can customize the same default security list or create your own. In the sample network illustrated above, there are two security lists – one for a database subnet and another for the middle tier subnet. The security list for the database subnet can have rules as shown below. The first rule indicates that the database instance can be accessed over the Internet on port 22 for SSH, and the second rule indicates that all network connections arising from the middle tier subnet (10.0.1.0) must be allowed to connect to all ports on instances running on database subnet. Also add Egress rules for each subnet as per your requirement. The example shown below allows connections to all destinations. Define an internet gateway as shown below. Also add any route tables if required. More details are available in OCI documentation here. It is important to ensure that the Cloud Manager and the file server instance has access to all subnets on which it will provision new environments. The NFS share in the file server on which DPKs are stored, is mounted on the instances being provisioned and hence all NFS ports must be opened in the security lists. More details about the VCN, subnets and security lists specific to Cloud Manager is available here. All security rules in this blog are not very restrictive and serve as examples to start with. It is always recommended to restrict access to subnets by adding more rules that allow only required ports. To learn more about securing access refer to OCI documentation here. Next, create subnets for each Availability Domain. In the example below, there are two subnets created for an Availability Domain evQs US-ASHBURN-AD-1. One subnet is used for hosting database instances and another to host the remainder of the instances, such as middle tier (running Application Server, PIA server and Process Scheduler), Windows client and Elasticsearch. Create similar subnets on each of the availability domains. This way, you’ll have a uniform network layout on each of the availability domains. Ensure that you select the right security list for each subnet. With this, the tenancy is ready for you to set up PeopleSoft Cloud Manager. You have set up a compartment, user, policies, VCN, subnets and security lists. Learn more about installing Cloud Manager here and how to use it here. In our previous blog we announced the release of the latest PeopleSoft Cloud Manager Image 6, which includes support for Oracle Cloud Infrastructure (OCI). Cloud Manager for OCI is designed to work in a simple way. Let’s try to understand those design aspects that must be considered for your planning. Deploy all instances of a PeopleSoft environment in a single OCI Region. Cloud Manager can deploy PeopleSoft environments in only one region, the one in which it is running. When you sign in to Cloud Manager in a browser and access the Cloud Manager Infrastructure Settings page, you see this region listed as “Deployment Region.” When you create or configure an environment template in Cloud Manger, you will see all regions listed, but you must always specify the region chosen as Deployment Region on the Cloud Manager Infrastructure Settings page. Deploy all instances of a PeopleSoft environment in a single Availability Domain (AD) in the chosen Deployment Region. In environment templates, you can set the AD in which you want to deploy an environment. All instances are deployed in the chosen AD. Cloud Manager doesn’t provide the ability to choose different ADs for each instance of the same environment. For example, you will not be able to deploy a Database instance in one AD and middle tier components (Application Server, Process Scheduler, and PIA) or a PeopleSoft Client instance in another AD. Deploy all instances of a PeopleSoft environment in a single compartment. While defining environment templates you get an option to choose the compartment in which an environment will be deployed. All instances of an environment will always be deployed in the selected compartment. You will not be allowed to deploy instances of the same environment across two or more compartments. For example, you cannot deploy a Database instance in one compartment and middle tier instances or a PeopleSoft Client instance on another compartment. Deploy the Cloud Manager instance, and all instances of a PeopleSoft environment, on a single VCN that is dedicated for PeopleSoft environments. The Cloud Manager instance must be deployed in the same VCN as all instances of a PeopleSoft environment. Under the dedicated VCN, you can create multiple subnets that can be used to isolate individual instances or production and non-production environments. Let’s go through those requirements that satisfy the above mentioned design considerations. To provision PeopleSoft environments in OCI using Cloud Manager, you’ll need to prepare your tenancy with a few pre-requisite configurations. When you get access to your OCI tenancy, you’ll have an administrator user only. You can find an overview about how to set up your tenancy here. Let’s start by creating a compartment in which all PeopleSoft environments will be provisioned. If you want to deploy your development, test or production environments on separate compartments, then create enough compartments for the various environments. For this blog, let’s assume we have created a compartment and named it nkpsft. Sign in as the administrator user for OCI, and create a user for Cloud Manager with sufficient privileges to create and manage instances, the Virtual Cloud Network and subnets. This involves multiple steps as outlined below. First, create a Group for Cloud Manager users; for example, CM-Admin. Next, create a policy, for example CM-Admin-Policy, to grant access to compartment nkpsft to Cloud Manager group. After that, create a user cloudmgr that will be used in Cloud Manager Settings. Finally, add cloudmgr user to CM-Admin group. With this, we have set up a compartment and a user with admin privileges to create and manage instances on OCI. In our next blog, we’ll talk about the next important pre-requisite – Networking. Cloud Manager Image 6 on OCI does not enforce a flat networking architecture, as it does in OCI-Classic. Your network admin can design and lay out the required networking architecture. You can create your own networking layout and Cloud Manager automation will use it to deploy PeopleSoft environments. Remember, you’ll be creating networking components in the same compartment that you had created earlier, so that Cloud Manager gets access to it. Oracle recently announced in a Tech Update that PeopleTools 8.57 will be generally available to all PeopleSoft customers for use first in the Oracle Cloud. Shortly after, most likely with the third PeopleTools patch (8.57.03) it will be available for on premises environments. This, understandably, has generated some questions so I thought I take a few minutes to clear things up. When we talk about running PeopleSoft in the cloud, we are talking about taking one or more of your existing PeopleSoft environments and instead of running them in your data center, they are run on hardware that you subscribe to and manage in the cloud. In this case, the cloud is Oracle’s Infrastructure as a Service, also called Oracle Cloud Infrastructure (OCI). When you move one of your environments to the cloud, it’s backed up to files, copied to a cloud repository and provision from the repository. We call that process ‘Lift and Shift’. When it’s done, your application with your data, your customizations, and your configurations is running in the cloud. Even though it’s in the cloud, you are responsible for maintaining it. What has changed is the infrastructure – servers, storage, network – that the application is running on. Just to be clear, there is no Software-as-a-Services (SaaS) version of PeopleSoft or PeopleTools, nor does Oracle have any plans to release one. So, thinking it through, the 8.57 release of PeopleTools that we make available in the cloud is exactly the same as the version you will install in your on premises environment. Why then are we releasing it first in the cloud? There are several reasons, but the most significant is to build awareness of the benefits of running PeopleSoft applications in the Oracle Cloud, and what that can mean to you. We believe that in the long term, the best way to run PeopleSoft applications is to do so in in the cloud. To make it even better, one of the major initiatives over the past couple of years is the release of PeopleSoft Cloud Manager. With Cloud Manager, many of the processes that are time consuming or difficult, particularly around lifecycle management, have been improved or automated. The PeopleTools upgrade, for instance, is automated. Just choose one of your application images from your cloud repository and start it with the latest Tools version and the app will be upgraded as part of the provisioning process. It’s that easy. And that’s just one example. It’s pretty easy to take advantage of the initial releases of PeopleTools in the cloud. In fact, as I write this there is a 30 day Trial Program that gives you free credits to try it out. Be sure to follow the correct OBE when installing. For more information go to this link or talk to your Oracle Account team. There is also a PeopleSoft Key Concept page about running Peoplesoft on the Oracle Cloud and PeopleSoft Cloud Manager where you can get more information. It only takes a small investment to try this out, and it could lead to major improvements in how you manage your applications. 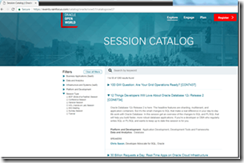 A dataset with all sessions of the upcoming Oracle OpenWorld 2017 conference is nice to have – for experiments and demonstrations with many technologies. 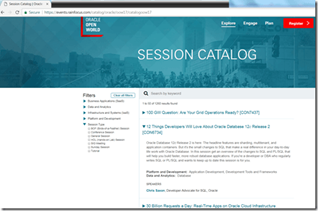 The session catalog is exposed at a website here. With searching, filtering and scrolling, all available sessions can be inspected. If data is available in a browser, it can be retrieved programmatically and persisted locally in for example a JSON document. A typical approach for this is web scraping: having a server side program act like a browser, retrieve the HTML from the web site and query the data from the response. This process is described for example in this article – https://codeburst.io/an-introduction-to-web-scraping-with-node-js-1045b55c63f7 – for Node and the Cheerio library. As you will find in this article – when server side scraping fails, client side scraping may be a much to complex solution. It is very well possible that the rich client web application is using a REST API that provides the data as a JSON document. An API that our server side program can also easily leverage. That turned out the case for the OOW 2017 website – so instead of complex HTML parsing and server side or even client side scraping, the challenge at hand resolves to nothing more than a little bit of REST calling. Read the complete article here. How can we modernize existing applications? What are the key elements for a future-proven strategy IT system architecture? How can the flexibility as well as the agility of the IT system landscape be ensured? But from our experience there’s no common answer for these questions, since every customer has individual requirements and businesses, but it is necessary to find pragmatic solutions, which leverage from existing best Practices – it is not necessary to completely re-invent the wheel. 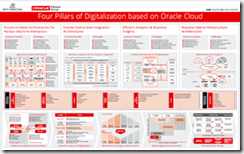 With our new poster „Four Pillars of Digitalization based on Oracle Cloud“ (Download it here) , we try to deliver a set of harmonized reference models which we evolved based on our practical experience, while conceiving modern, future-oriented solutions in the area of modern application designs, integrative architectures, modern infrastructure solutions and analytical architectures. The guiding principle, which is the basis for our architectural thoughts is: Design for Change. If you want to learn more, you can refer to our corresponding Ebook (find the Ebook here, only available in German at the moment). Usually the technological base for modern application architectures today is based on Cloud services, where the offerings of different vendors are constantly growing. Here it is important to know which Cloud services are the right ones to implement a specific use case. 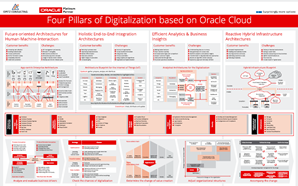 Our poster „Four Pillars of Digitalization based on Oracle Cloud“ shows the respective Cloud services of our strategic partner Oracle, which can be used to address specific challenges in the area of digitalization. Get the poster here. For regular information become a member in the Developer Partner Community please visit: http://www.oracle.com/partners/goto/wls-emea ( OPN account required). If you need support with your account please contact the Oracle Partner Business Center. Oracle API Platform Cloud Services - API Design This is the first video of a series to showcase the usage of Oracle API Platform Cloud Services. API Management Part 1 of 2. Oracle API Cloud Services This is the second video of a series to show case the usage of the brand new Oracle API Platform CS. This is part one of API Management Oracle API Platform Cloud Services - API Management part 2 This is the 3rd video of the series. In specific here we will see the second part of the API Management functionality focused on Documentation. Oracle API Platform CS - How to create an app This is the 4th video of this series. In this video you will learn how to create an application. 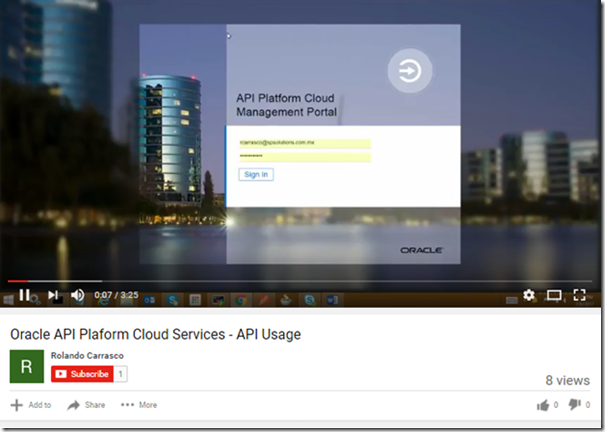 Oracle API Plaform Cloud Services - API Usage This is the fifth video of this series. In this video I will showcase how you will interact with the APIs that are deployed in APIPCS. Thousands of customers use Oracle Fusion Middleware and Databases today. With Bring Your Own License they can move easy workload to the cloud. As they already own the license the customer needs to pay only a small uplift for the service portion of PaaS. This is a major opportunity for Oracle partners to offer services to this customers. 1) Use Big Data Cloud Service, where you get full Cloudera cluster and there you could deploy Apache Kafka as part of CDH. 2) Event Hub Cloud Service Dedicated. Here you have to specify server shapes and some other parameters, but rest done by Cloud automagically. 3) Event Hub Cloud Service. This service is fully managed by Oracle, you even don't need to specify any compute shapes or so. Only one thing to do is tell for how long you need to store data in this topic and tell how many partitions do you need (partitions = performance). Today, I'm going to tell you about last option, which is fully managed cloud service. It's really easy to provision it, just need to login into your Cloud account and choose "Event Hub" Cloud service. Put some parameters - two key is Retention period and Number of partitions. First defines for how long will you store messages, second defines performance for read and write operations. Today I want to show "Hello world" flow. How to produce (write) and consume (read) message from Event Hub Cloud Service. Now I'm going to show it in some details. For dealing with Event Hub Cloud Service you have to be familiar with concept of OAuth and OpenID. If you are not familiar, you could watch the short video or go through this step by step tutorial. In couple words OAuth token authorization (tells what I could access) method to restrict access to some resources. One of the main idea is decouple Uses (real human - Resource Owner) and Application (Client). Real man knows login and password, but Client (Application) will not use it every time when need to reach Resource Server (which has some info or content). Instead of this, Application will get once a Authorization token and will use it for working with Resource Server. This is brief, here you may find more detailed explanation what is OAuth. Obtain Token for Event Hub Cloud Service client. as you can see there are many parameters required for obtain OAuth token. and you will find another two variables, which you need for OAuth token - Scope and Primary Audience. Well, now we have Authorization token and may work with our Resource Server (Event Hub Cloud Service). Note: you also may check documentation about how to obtain OAuth token. this script will generate output file, which will contain variables, that we will need to consume messages. If everything fine, this request will not return something. Finally, we approach last step - consuming messages. Today we saw how easy to create fully managed Kafka Topic in Event Hub Cloud Service and also we made a first steps into it - write and read message. Kafka is really popular message bus engine, but it's hard to manage. Cloud simplifies this and allow customers concentrate on the development of their applications. The majority of respondents cited economic factors as the reason they made the leap, and it’s easy to see why: Nucleus Research recently published a report that cloud delivers 3.2x the return on investment (ROI) of on-premises systems, while the total cost of ownership (TCO) is 52% lower. But even more surprising were the benefits realized once our survey respondents got to the cloud. An astonishing 81% cited “Staying current on technology” as the main benefit of moving to cloud ERP. With a regular cadence of innovation delivered by the cloud, it is easier for companies to quickly incorporate game-changing technologies into everyday business processes—technologies like artificial intelligence, machine learning, the Internet of Things (IoT), blockchain and more. In the cloud, the risk of running their businesses on obsolete technology drops to zero. It’s the last upgrade they will ever need. As new capabilities are rolled out, cloud subscribers like Blue Shield can take advantage of them immediately. This gives them the agility to be both responsive and predictive. Uncertainty is the new normal in business and managing amid uncertainty is a must. It’s no longer enough to be quick-to-change; competitive companies must also have reliable insight into how potential future scenarios could impact performance. At the most recent Data and Analytics Summit, we caught up with Charlie Berger, Senior Director of Product Management for Data Mining and Advanced Analytics to find out more. This is article is based on what he had to say. Putting your model into practice might longer than you think. A TDWI report found that 28% of respondents took three to five months to put their model into operational use. And almost 15% needed longer than nine months. So what can you do to start deploying your machine learning faster? In the following points, we’re going to give you a list of different ways to ensure your machine learning models are used in the best way. But we’re starting out with the most important point of all. Get started, even if you know that you’ll have to rebuild the model once a month. The learning you gain from this will be invaluable. Starting with a business problem is a common machine learning best practice. But it’s common precisely because it’s so essential and yet many people de-prioritize it. Now be sure that you’re applying it to your machine learning scenarios. Below, we have a list of poorly defined problem statements and examples of ways to define them in a more specific way. Think about what your definition of profitability is. For example, we recently talked to a nation-wide chain of fast-casual restaurants that wanted to look at increasing their soft drinks sales. In that case, we had to consider carefully the implications of defining the basket. Is the transaction a single meal, or six meals for a family? This matters because it affects how you will display the results. You’ll have to think about how to approach the problem and ultimately operationalize it. Beyond establishing success metrics, you need to establish the right ones. Metrics will help you establish progress, but does improving the metric actually improve the end user experience? For example, your traditional accuracy measures might encompass precision and square error. But if you’re trying to create a model that measures price optimization for airlines, that doesn’t matter if your cost per purchase and overall purchases isn’t going up. The Achilles heel in predictive modeling is that it’s a 2-step process. First you build the model, generally on sample data that can run in numbers ranging from the hundreds to the millions. And then, once the predictive model is built, data scientists have to apply it. However, much of that data resides in a database somewhere. Let’s say you want data on all of the people in the US. There are 360 million people in the US—where does that data reside? Probably in a database somewhere. Where does your predictive model reside? What usually happens is that people will take all of their data out of database so they can run their equations with their model. Then they’ll have to import the results back into the database to make those predictions. And that process takes hours and hours and days and days, thus reducing the efficacy of the models you’ve built. However, growing your equations from inside the database has significant advantages. Running the equations through the kernel of the database takes a few seconds, versus the hours it would take to export your data. Then, the database can do all of your math too and build it inside the database. This means one world for the data scientist and the database administrator. By keeping your data within your database and Hadoop or object storage, you can build models and score within the database, and use R packages with data-parallel invocations. This allows you to eliminate data duplications and separate analytical servers (by not moving data) and allows you to to score models, embed data prep, build models, and prepare data in just hours. As James Taylor with Neil Raden wrote in Smart Enough Systems, cataloging everything you have and deciding what data is important is the wrong way to go about things. The right way is to work backward from the solution, define the problem explicitly, and map out the data needed to populate the investigation and models. And then, it’s time for some collaboration with other teams. Here’s where you can potentially start to get bogged down. So we will refer to point number 1, which says, “Don’t forget to actually get started.” At the same time, assembling the right data is very important to your success. For you to figure out the right data to use to populate your investigation and models, you will want to talk to people in the three major areas of business domain, information technology, and data analysts. Business domain—these are the people who know the business. Information technology—the people who have access to data. Data Analysts—people who know the business. Why didn’t you use this data? You may think, I have all this data already at my fingertips. What more do I need? Sure, you can make a guess based off that information. But if you’re able to first compare the amount of the current lottery prize versus the typical prize amounts, and then compare that derived variable against the variables you already have, you’ll have a much more accurate answer. Ideally, you should be able to A/B test with two or more models when you start out. Not only will you know how you’re doing it right, but you’ll also be able to feel more confident knowing that you’re doing it right. But going further than thorough testing, you should also have a plan in place for when things go wrong. For example, your metrics start dropping. There are several things that will go into this. You’ll need an alert of some sort to ensure that this can be looked into ASAP. And when a VP comes into your office wanting to know what happened, you’re going to have to explain what happened to someone who likely doesn’t have an engineering background. Then of course, there are the issues you need to plan for before launch. Complying with regulations is one of them. For example, let’s say you’re applying for an auto loan and are denied credit. Under the new regulations of GDPR, you have the right to know why. Of course, one of the problems with machine learning is that it can seem like a black box and even the engineers/data scientists can’t say why certain decisions have been made. However, certain companies will help you by ensuring your algorithms will give a prediction detail. Once you deploy, it’s best to go beyond the data analyst or data scientist. What we mean by that is, always, always think about how you can distribute predictions and actionable insights throughout the enterprise. It’s where the data is and when it’s available that makes it valuable; not the fact that it exists. You don’t want to be the one sitting in the ivory tower, occasionally sprinkling insights. You want to be everywhere, with everyone asking for more insights—in short, you want to make sure you’re indispensable and extremely valuable. Given that we all only have so much time, it’s easiest if you can automate this. Create dashboards. Incorporate these insights into enterprise applications. See if you can become a part of customer touch points, like an ATM recognizing that a customer regularly withdraws $100 every Friday night and likes $500 after every payday. Here are the core ingredients of good machine learning. You need good data, or you’re nowhere. You need to put it somewhere like a database or object storage. You need deep knowledge of the data and what to do with it, whether it’s creating new derived variables or the right algorithms to make use of them. Then you need to actually put them to work and get great insights and spread them across the information. The hardest part of this is launching your machine learning project. We hope that by creating this article, we’ve helped you out with the steps to success. If you have any other questions or you’d like to see our machine learning software, feel free to contact us. You can also refer back to some of the articles we’ve created on machine learning best practices and challenges concerning that. Or, download your free ebook, "Demystifying Machine Learning." So, what is new and exciting in PeopleSoft Cloud Manager Version 6? For the first time, there are two images provided: one for OCI, and the other for OCI Classic. The Cloud Manager Image 6 for OCI supports a number of OCI features, including Regions, Virtual Cloud Networks, Subnets, Compute and DB System platforms. With this image, instances will be provisioned on VM shapes. Customers can lift and shift PeopleSoft environments from on-premises to OCI using the same approach they used OCI Classic. For PeopleSoft Cloud Manager on OCI Classic, we have enabled support for the lift and shift of on-premises databases encrypted with Oracle Transparent Data Encryption (TDE). TDE offers another level of data security that customers are looking for as data is migrated to the cloud. A ‘Clone to template’ option is also available for encrypted databases. The lift utility requires a few parameters for TDE so that the encrypted database may be packaged and lifted to the cloud. During shift process, the same parameters are required to deploy the lifted database. Customers have also requested an enhancement to support non-Unicode databases for PeopleSoft environments. PeopleSoft Cloud Manager Version 6 supports lift and shift of environments that use non-Unicode Databases. Unlike image 5, a conversion of the on-premises database to Unicode is no longer required prior to using Cloud Manager’s Lift and Shift automation. To get your hands on the new Cloud Manager images, go to the Oracle Marketplace and look for either the OCI-Classic image or the OCI image…or try both! Be sure to review the documentation and additional important information mentioned in the Marketplace listings. We are excited to combine the automation of provisioning and maintenance that PeopleSoft Cloud Manager provides with the robust benefits of Oracle Cloud Infrastructure. Combining support for OCI with the additional features of non-Unicode databases and TDE encrypted databases, we expect all customers to benefit from the latest Cloud Manager image, using whichever Oracle Cloud is right for you. Stay tuned for additional information and more Cloud Manager features. Now, off to the next image! Fortunately, it’s becoming easier to enter the CX winner’s circle. AI, machine learning, IoT, behavioral analytics, and other innovations are helping progressive companies capitalize on internal and third-party data to deliver highly personalized communications, promotional offers, and service engagements. How can companies fully leverage today’s tools to support exceptional CX? If they haven’t already done so, companies should start evolving away from cloud 1.0 infrastructures, where an amalgam of best-of-breed services runs various business units. These standalone cloud platforms might have initially provided quick on-ramps to modern capabilities, but now, many companies are paying a price for that expediency. Siloed data and workflows hinder the smooth sharing of customer information among departments. This hurts CX when a consumer who just purchased a high-end digital camera at a retail outlet, for example, webchats with that same company’s service department about a problem, and the service team has no idea this is a premium customer. In contrast, cloud 2.0 is focused on achieving a holistic view of customers—thanks to simplified, well-integrated services that support each phase of the customer journey. Eliminating information silos benefits companies by giving employees all the information they need to provide a tailored experience for every customer. Achieving modern CX requires the right vendor partnerships. That starts with evaluating cloud services according to how complete, integrated, and extensible the CX platform is for supporting the entire customer journey. One option is the Oracle Customer Experience Cloud (Oracle CX Cloud) suite, an integrated set of applications for the entire customer lifecycle. It’s complemented by native AI capabilities and Oracle Data Cloud, the world’s largest third-party data marketplace of consumer and business information, which manages anonymized information from more than a billion business and 5 billion consumer identifiers. This means that business leaders, besides understanding customers based on their direct interactions, can use Oracle Data Cloud for insights into social, web surfing, and buying habits at third-party sites and retailers and then apply AI to find profitable synergies. As new disruptive technologies come to the market—whether that’s the mainstreaming of IoT or drones for business—companies will be under constant pressure to integrate these new capabilities to improve their CX strategies. Modern, integrated cloud services designed for CX don’t support just today’s innovations. With the right cloud choices, companies can continually evolve to meet tomorrow’s CX challenges. The single, standalone server with one CPU has gone the way of the dodo bird, displaced by the cloud, server farms and multithreaded parallel processors. Yet colleges and universities are still mainly teaching their undergraduates sequential programming—programs that execute instructions one after the other—as they have for decades. Modern computing environments and massive data sets demand not just that we process multiple instructions simultaneously across multiple servers (distributed computing), but also that programs be written to process multiple instructions simultaneously on multicore chips within multiple servers and devices. Too often, parallel programming is relegated to a single chapter in a textbook, easily skipped when time in the semester runs short. To prepare students for high-performance computing, big data, machine learning, blockchain and more, we must teach them to both think and program in parallel. With the ubiquity of battery-driven computers, energy efficiency is more important than ever. The more we ask our smart devices to do, the more energy they need to do it and the more quickly they exhaust their batteries. The same is true for massive server clusters, where fires related to energy-consumption are not uncommon as we demand faster and faster processing of more and more data. How you architect a software program directly affects how much energy is needed to execute the program, yet few undergraduate programs teach students about this relationship. In a fast-warming world, one in which we dream big dreams about all the ways artificial intelligence and high-performance computing will make our lives better, it is imperative that we write energy-optimized software. Students will not be able to do that if we don’t teach them how. Academia persists in trying to measure what individual students know. In most programming classes, students start from a blank screen and write clean code independently or, less often, with a partner. But this isn’t how software is engineered in the real world. Professional software engineers almost always start with someone else’s code and work collaboratively in large groups to modify, improve and correct that code, which is then integrated with code written by other engineers in other groups. It’s common for software development groups to include people from different countries, in different time zones. Working effectively requires team members to communicate well in different languages and across different cultures. It also means that someone else needs to be able to look at your code and know what it does, so following formatting standards and providing clear commenting are critical. However, in our desire to ensure that each student understands every programming concept and rule of syntax, we overlook opportunities to teach collaborative software development and help students develop critical professional skills. In the minds of most college students, IBM, Intel, and AMD—the inventors and developers of the multicore processor—are old news…old companies founded by old guys. Mobile applications are where the action is. But mobile apps are driven by data, usually by a lot of data, and they won’t be of much use without the processors, databases and networks that power them. Computing works and advances based on the entire system, from the power source to the user interface, and students will be more successful if they know how to open the box and “kick the tires.” They can then optimize for energy efficiency and write parallel code that makes use of new hardware architectures. They can manage caching, memory architecture and resource allocation issues. They can explain and explore quantum computing. Computer science doesn’t stop at software or coding. Students need foundations in hardware architecture, too, including electrical engineering and physics. We need computer scientists who can test and push the boundaries of hardware just as much as they push what can be achieved with software. Something I heard at the Turing 50th Anniversary celebration last summer has stuck with me: Computing is not neutral. It can be used for good or evil. It can be used to help people and it can be used to manipulate and harm them. Just because we can do something with computing, however, doesn’t mean we should. Computing power is so great that we need policies to regulate and manage it, in order to protect and benefit people. It’s important for students of computing to understand its history and to take courses grounded in ethics so they can make responsible decisions and guide others. They should know computing’s historical villains and heroes, its inventors and detractors, and how it has been used to benefit and hurt people. The old saw applies here: If we do not learn our history, we are doomed to repeat it. Even in a crowded curriculum, we must ensure students are gaining the skills and knowledge they need to become technology innovators, business leaders and positive contributors to society in the coming decades. This list is only a starting point.